I’m still learning how to bend. The end of 2013 was pretty magical for me. I felt an amazing sense of joy and hope – along with confusion, fear and probably a little bit of pain. Mostly hope, though. I’m not sure what I expect out of 2014 at this point. Actually, I have a few expectations. I don’t really know they’ll work together yet, but I’m also trying not to plan as much this year. Planning is my specialty. It’s my happy place. It’s what makes me calm. But I’m trying to back off. To let go. To love the moment for what it is and not what it could be – or will be soon. Just for what it is. I suppose I’ll extend that to people, as well – I want to love people more for exactly who they are. Not who they are to me or what I’ve decided they are, but who they innately are. Their very core. Because that’s what everyone deserves – lots of love for no reason other than they are another soul walking this earth who’s trying to make the best of what they have in front of them. I think that’s what I’ll probably work on the most. I don’t know if I have any resolutions, or maybe I have too many. I want to be in the moment. I want to worry less. I want to love more. I want to follow my heart. I want to help you follow yours. I want to be proud of the person I am. I want to cry just a little more. I hope for lots of laughter. I hope for more learning moments. I hope for more teaching moments. I hope for more moments where everything makes perfect sense, if only because it so beautifully doesn’t. I pray for peace in my heart. I pray for happiness. For me. For you. For those people I couldn’t make it through a single day without. Most of all, I pray the good moments outshine the bad. I pray we all look back on this year and rejoice because it was so beautiful. That’s probably asking for a lot, but nothing ever happened with low expectations. I hope we all do this – and I want to show off my new tattoo. 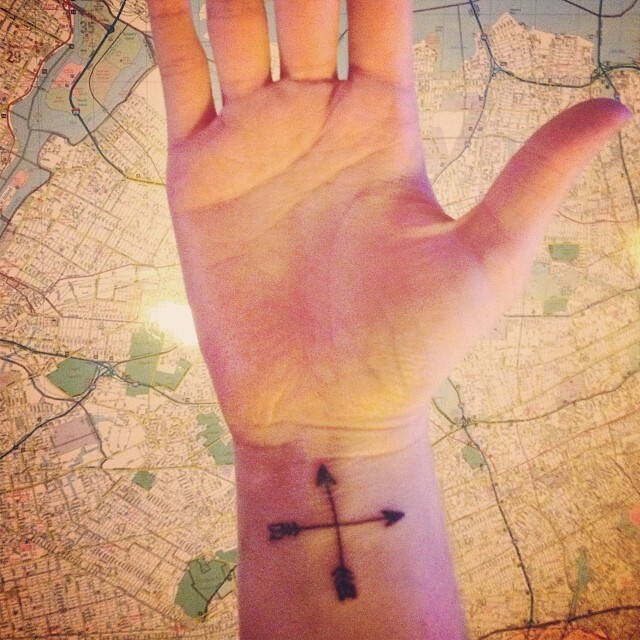 In the words of Kacey Musgraves, follow your arrow and such. ← You’re like 22 girls in one, and none of them know what they’re running from.